After 12 games and 12 draws, American Fabiano Caruana is seeking to take the title from Norwegian Magnus Carlsen. After drawing their final match in London on Monday, they head to a series of fast-paced tie-breakers, culminating in a game type known as "Armageddon". If he wins, Caruana will be the first US world champion since Bobby Fischer in 1972. But in Wednesday's tie-breaker, he will again face a fierce title defence from Carlsen, who has been champion since 2013 and is the top-ranked player in the world. The two players were locked in a soundproof box at the play venue for some three hours before Carlsen offered his opponent a draw. 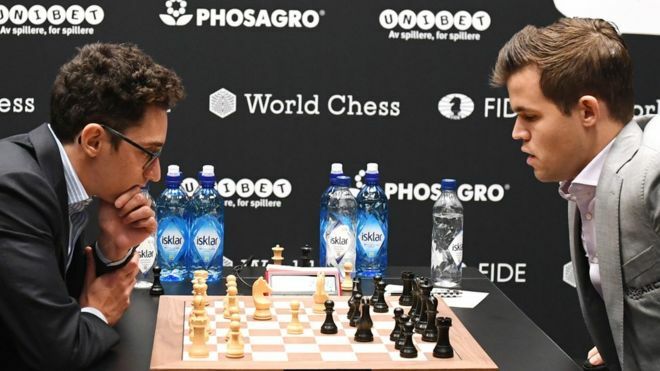 The game's moves were live-streamed with commentary from other chess grandmasters across platforms including YouTube and popular video game streaming site Twitch.tv. The 12-draw series in London makes it one of the most fiercely contested in history. The tie-breaker will be a series of increasingly fast games. Carlsen will be seen as the favourite as he is considered an expert at rapid chess. However, former grand master Garry Kasparov tweeted that he thought the draw offer indicated the Norwegian was losing his nerve. If it is still a draw after that, two "blitz" games are played - with just five minutes per player and three added seconds per turn. In such circumstances, mistakes are much easier to make. In the unlikely event that after two sets of blitz, the title is still tied, a sudden death variety called "Armageddon" is played. In this chess game type, there will be a winner - a draw means a victory for the player wielding the black game pieces. To compensate, white gets more time on his clock - a minute more, but the pace is still as fast as a blitz game.